Steve Gentry is a 4th generation Orinda resident (since 1870) who is very active in several community organizations, including the Wagner Ranch Nature Area, which enhances K-6 education in the fields of biology, ecology, environmental studies, sociology and nutrition. Wagner Ranch is an 18-acre historic site and nature preserve located adjacent to Wagner Ranch Elementary School in Orinda. Last year he was the president of the new non-profit "Friends of Wagner Ranch Nature Area" organization, and as a direct result of his efforts, Steve has raised over $36,000 for preservation of the ranch. Steve is also working with the UC Berkley Botanical Gardens to liven up the tropical house building by installing a year around demonstration bee hive. Steve started out attending Humboldt State University studying to become a marine biologist. To support himself and frequent trips to Europe he worked as a painter and contractor. He quickly found that contracting paid better than the marine biology jobs at the time, and became a full time remodeling contractor. The contracting business also allowed for more free time to pursue travel. On one trip Steve spent 10 months with Maharishi Mahesh Yogi and the Beatles. Steve took a local bee course in 1979 and soon after helped found the Mount Diablo Beekeepers Association. In 1982, the members wrote a charter and became an official association. As a past president and Beekeeper of the Year awardee, Steve now serves an advisory role to its more than 240 members. Steve is a board member for the Contra Costa Certified Farmers Markets in Orinda, Walnut Creek, Moraga, and San Ramon. 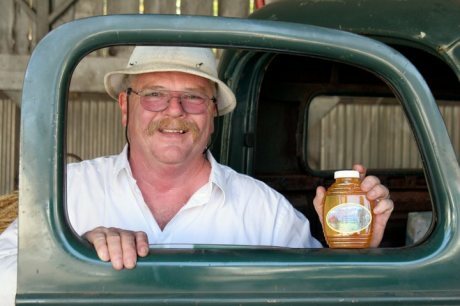 Steve sells his honey at Diablo Foods, Open Sesame, and Chow Restaurant in Lafayette, at Whole Foods in Walnut Creek and San Ramon, at Natural Life Foods in Pleasant Hill, and at Windmill Farms in San Ramon. Steve has been featured on the Food Network and in many magazine and newspaper articles; see our News & Events page for a sampling.